2 Comments on What Are the Advantages of Students Having Access to Computers? The computer is one of the most important inventions in the 20th century, which was changed our lives since it was first introduced. It is undeniable to say that the computer has resulted in both positive and negative effects which must be addressed accordingly. To begin with, the computer has contributed to our lives in many beneficial ways. The main use of computer is to help us store and organize informations even tons of files within hard disk drives. Thanks to the advancement in technology, computers nowadays can process information far faster than the human brain can do. It simply means that the computer helps us work efficiently and save time. Computer, the Internet, and other technologies advance, they are playing a significant role in our daily lives. They are now a part of our work lives and we use it at home for financial reasons, acquiring news stories, research and education, and communicating with friends and families. It is playing more of a significant role in our lives. These high-tech tools are important for children to learn and use. Technology is a doorway to education and job skills. The necessity of learning and understanding emerging technologies has resulted in the need to offer it in schools. Because of the internet, students now have an abundance of knowledge at their finger tips. It is no longer textbooks that teach children. The internet offers a host of knowledge resources to help children learn. The internet also has an abundance of interactive programs that can be downloaded or used online that will help children improve their reading, language, math, science and other course skills. There are appropriate games and exercises for any age. They can help assess a child’s level of learning and understanding as well as identify any learning weaknesses. The high tech tools can also help with memory and hand-eye coordination. There is also an increasingly more of a need for more high school graduate to major in high-technology related fields when they enter college. Many jobs now involve high tech tools. Preparing a child for a productive future will greatly improve the chances of them acquiring a rewarding and lucrative career. Students that learn about high-tech tools in a hands-on way will help them overcome any insecurity that they may have about advanced technology. It will show them that high tech is something to be embraced, not feared. New high-tech tools in such areas as science provide students with a new ways of experimenting and observing in more detailed and graphic ways. For example, this will help improve their overall understanding because the students can remotely control microscopes at laboratories that may be thousands of miles aways from the school and the can speak to experts in just about any field. The students will be more compelled to learn. It can improve the skills needed for success on standardized tests. It helps with the development of critical and innovative thinking skills. They will learn not to regurgitate information, but to explain it in a more comprehensive way. 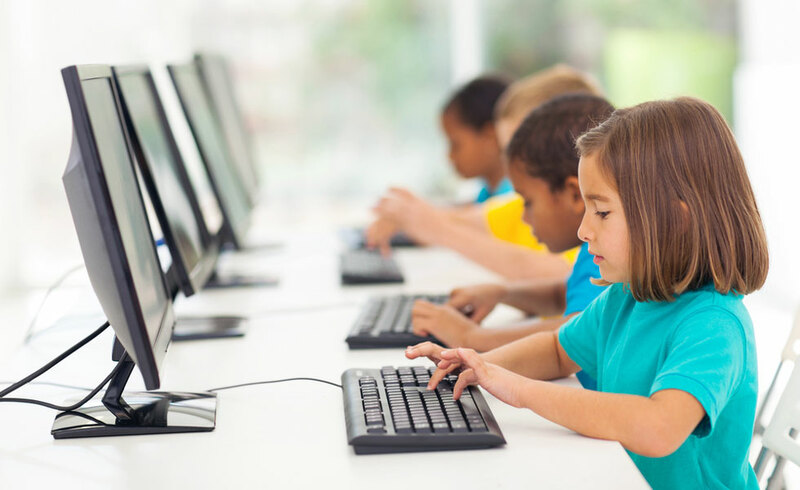 Studies have shown that technology based learning environments have helped at risk students overcome barriers and have contributed to increased success rates. Technology enhances work projects through such processes as computer word processing, and creating charts, tables, and graphs. It will give them as insight into the work world. Technology now touches almost every part of our lives, our communities, and our homes. Schools should take advantage of all that technology has to offer students in the areas of teaching and learning. High-tech learning will help students acquire the skills they need to flourish in this highly technical knowledge based economy. Online programs work well for people who are self-motivates and have good time management skills. If you-re someone who needs more academic support and encouragement, though, you ‘ll find that most online programs create chat groups for students. This give you instant access to peers for homework help, study groups and friendship. Unlike traditional learning, where you have to schedule and appointment with your professor during office hours, online programs give you quicker access to your instructors through email or instant messaging. Read materials online or download them for reading later. Online learning accommodates your preferences and needs – it’s students centered. Online learning enables students centered teaching approaches. Every student has their own way of learning that works best for them. Some learns visually others do better when they “Learn by Doing”. Choose instructor led or self study courses. Skip over material you already know and focus on topics you’d like to learn. Students get the chance to read and re-read lectures, discussions, explanations and comments. Use the tools best suited to your learning styles. Believe it or not, online courses help you brush up your online abilities. Seriously, you will be better at dealing with email, bulletin boards, online research, and you will learn countless other skills along the way that you probably never realized had anything to do with the courses you are actually taking because they don’t. In other words, you are getting more of an education that you bargained for when it comes to online learning. Because there are no geographic barriers to online learning, students can find diversity of course material that may not be available to them where they live or work. This article is presented by David A. Buhr. He has over fifteen years of experience in the field of education. He specializes in setting up Education States. He is an expert in the area of developing strategies of Education. He is presently working at his Home tuition agency in Singapore. Online learning is on the rise. Students can access their course at any time, from anywhere they can log on, in most cases. This means that parents, working students, and professionals on the move have the option of attending classes no matter their work schedule. Students only need a computer and Internet access to take online classes. Students may be able to choose from a wider breadth of degree programs. Eventually, thanks for sharing your thought with us. That is right Amar, today we only need 3 things – Computer, the Internet, and Knowledge Seeker to learn things. There are tons of things online to learn.